It pickled KLEARCOAT glass into the Snuff oil. KLEARCOAT Glass is the glass coated with Teflon® PFA film and is used for adoptable to glass gages and sight glasses. Benefits : Resistance to chemical reaction and corrosion Teflon® PFA film and our unique coating technology provides excelent resistance against chemical reaction and corrosion. Teflon® PFA Less adhiesiveness of Teflon® and transperency kept by our unique coating technology provides clear vision of sticky liquid level. The surface coated with TEFLON® PFA film repels water, oil and almost all sticky substances. If such a substance should stick to it, it can be easily washed off. KLEARCOAT GLASS is applicable to the fluid at maximum 170℃. 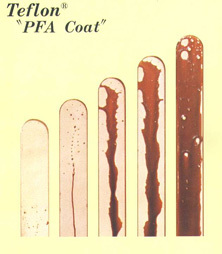 Teflon&req; PFA coat prevents glass from breaking into pieces. 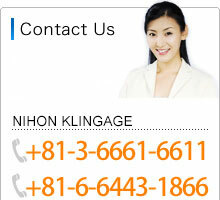 NIHON KLINGAGE provides vaious shape of KLEARCOAT glasses for Direct Reading Liquid Level Gage, Sight Glass and other applications.